Recently took this project out of the drawer and decided it’s time to finish it. It’s the first game we started when we created MiniChimera, but as it often happens we got sidetracked with other projects. It also helped that took me roughly 3 years to finish writing the whole story. We’ll have a sort of “preview” available soon, probably sometime this month, on Itch.io. 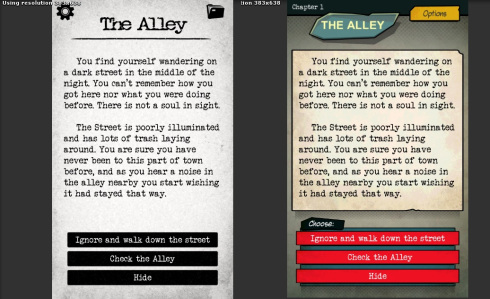 This will include the first chapter of the game (from a total of 10), and it’s called The Alley. This preview will be used to gather some feedback as we implement the rest of the game, and also as a mean to help spread the word. This is a choose your own adventure game about a man who wakes up from a blackout in a dark street in the middle of the night. He soon learns he took part in something terrible that caused the blackout, so the player has a choice to steer away from it and go home, or dig into it. The story changes a lot depending on the player’s choice, and there is no game over or dice rolls, only different paths and endings. The story and mood highly inspired by White Wolf’s World of Darkness and H.P. Lovecraft. It’s a seemingly normal world with a lot of twisted stuff happening in the shadows, just beyond the reach of a regular passerby, but as soon as someone get’s a glimpse of what’s going on, there’s no way back. At some point along the project we changed the style to make it look like a comic book, here’s some comparison shots. It’s hard to believe I was once satisfied with the old style, initially I wanted something more along the “black and white” style, but now I cannot look back. It’s a good reminder that you should keep changing and iterating until you are completely satisfied! Snap Quiz Challenge now available on iOS! Snap Quiz Challenge is now available on the App Store! Snap Quiz is a fast paced quiz featuring more than a hundred questions from 11 categories including movies, books, video games, geography, music, famous quotes and more! Snap Quiz Challenge now available on Android! Snap Quiz Challenge is now available on the Google Play store!